Aaron has been in the automotive industry for over 10 years and has his Bachelors of Business Administration from Anderson School of Management. Aaron understands that purchasing a vehicle is a difficult decision. He is very knowledgeable and personally gets involved selecting vehicles that are safe, reasonably priced and great looking. He gathers as much information as possible and personally drives each vehicle. 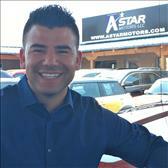 Aaron enjoys the automotive industry and believes in making every customer a lifetime customer of his business. He takes great pride in being open & honest with his customers and his goal is to ensure you have complete trust and satisfaction when purchasing a vehicle with A-Star Motors. Please allow his team the opportunity to make your vehicle purchase an exceptional experience.